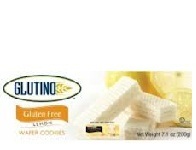 Glutino started in 1983. They specialize in gluten-free products. 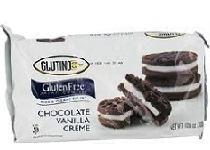 See 259+ Glutino Reviews and save an extra 10% on Glutino with Coupon Code* YAG250 at iherb.com/Glutino?rcode=YAG250. Nutrition: Serving 30 g, Calories 140, Fat 6 g, Carbs 21 g, Fiber 0 g, Sugar less than 1 g, Protein 0 g.
Ingredients: Corn Starch, Potato Starch, Palm Oil, Sugar, Sea Salt, Cellulose Gum, Soy Lecithin, Sodium Bicarbonate, Yeast Extract, Sodium Acid Pyrophosphate, Citric Acid, Sodium Hydroxide. Contains soy. May contain traces of sesame. Nutrition: Serving 40 g, Calories 140, Fat 2 g, Carbs 30 g, Fiber 3 g, Sugar 17 g, Protein 2 g.
Ingredients: Blueberry filling (sugar, apple powder [calcium stearate], white grape juice concentrate, glycerin, blueberries, corn starch, water, canola oil, citric acid, sodium alginate, malic acid, sodium hexametaphosphate, dicalcium phosphate, dried citrus pulp, sodium citrate, natural flavor, carrot and blueberry juice), chick pea flour, potato starch, fructose, pear juice concentrate, raisin paste, inulin, canola oil, tapioca starch, white rice flour, water, sodium bicarbonate. May contain soy. Made in a dedicated gluten free facility.